Homeboard is a launcher homepage and shortcut dashboard, both for web and mobile devices. You can add all of your favorite frequently used site shortcuts to your dashboard, and also discover new sites used by your friends or by other users with similar profiles. Once shortcuts are added to your board, you can browse them in a simple and friendly way and make optimized web searches, forgetting about typing or having to remember URLs. Once your board is set, your user profile will be generated automatically, and all site shortcuts will be added to the profile page. You can then share the profile URL as your unique web ID. You can access Homeboard by typing the following URL in your web browser: http://homeboard.me/. We strongly recommend you to add Homeboard as a favorite or to download our extension for Google Chrome (much better!). Homeboard is only supported in the following browsers: Google Chrome, Mozilla Firefox, Opera, Internet Explorer (8+). Just browse to http://homeboard.me/, fill your details under "Sign up with email", click "Sign Up", complete the 4 steps, and you are set to go (Note: You can skip one or more steps in the registration process). Just browse to http://homeboard.me/, click on "Sign Up Now". Click the "Continue using Facebook" button, complete the 2 steps, and you are set to go (Note: You can skip one or more steps in the registration process). 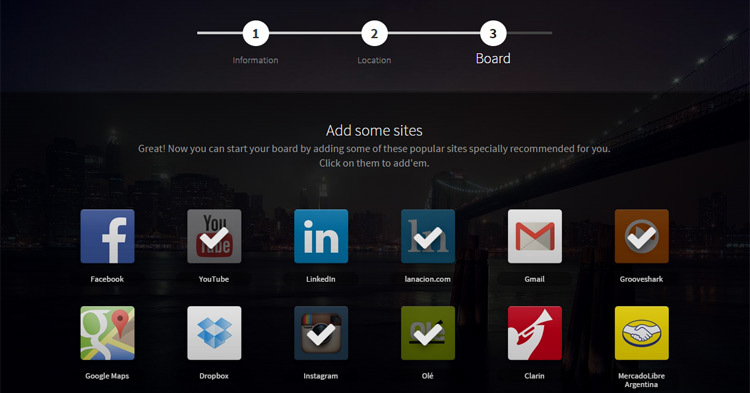 Your board is the first page you'll see every time you log in to Homeboard. It's where you'll be able to access all the shortcuts of your favorite sites. Once you've added a shortcut to your board, you are ready to use it. Shortcuts added to the board will show every time you access, unless you delete them. To customize your board, just click the button (located at the bottom left corner of your board). You'll be able to change the shortcuts' positions and delete any shortcut you are not using any more, as well as changing your background image. Once you finish editing your board, just click "Save Changes" to confirm your edition. A shortcut is just that, a combination of an icon and a text label that, when clicked, takes you to a certain web address. What is the shortcut store? The shortcut store is the place where you can search for shortcuts, browse shortcuts by category or recommendation and create custom shortcuts. the last step of the registration process, choosing one or more of the suggested shortcuts. the shortcut store, which can be accessed clicking on the Add shortcut button located to the top left of your board. our Google Chrome Extension, just by browsing to the desired site and clicking on the Homeboard icon in your browser. There are two shortcut types: regular shortcuts and custom shortcuts, which can be set as public or private. What is a custom shortcut? You can choose to add custom shortcuts to your board if the site's shortcut you are looking for is not listed in the shortcut store. Just browse to the shortcut store, and click on the "ADD CUSTOM SHORTCUT" button. Then write down a label, choose an icon using the arrows next to it, and click on Add. Voila! Shortcut is now on your board. Private shortcuts won't show in your public profile, nor in updates to your friends. Nobody will see these shortcuts but you (and only if you are signed in to your board). According to the site's contents, regular shortcuts may be flagged as Private, or not. If you'd like to set a shortcut and it's not set to Private by default, please create a custom shortcut and check the Private option. You can suggest a shortcut that you believe should be in our store through the shortcut submission form. We automatically add new shortcuts that are popular. From the web search box, you can search anything you want on the web, quick launch your favorite sites and even add new shortcuts to your board. What is my profile for? Your profile is your online identity. Let anybody find you in all your social networks at once, and check which sites you are visiting. Your private shortcuts will not show in your profile page. Just click on your picture (at the top right corner of Homeboard), then click on "View profile". To edit you profile, just browse to your profile and click the EDIT PROFILE button, under your profile picture. You'll be able to configure all your social profiles (don't forget to click the Save Changes button once you are done). Your followers will be able to see which sites you add to your board, and you will be able to see which sites are added to the boards of people you follow (following). Just click on your picture (at the top right corner of Homeboard), then click on "Find friends". You will then be able to find new connections and edit your current ones. All information asked by Homeboard is to give you the best experience using the service. It's very important that fill in accurately your account details, so we can suggest you relevant and interesting sites. Just click on your picture (at the top right corner of Homeboard), then click on "Account settings". Don't forget to Save Changes once you have finished editing your user information! Our extension sets Homeboard as you New Tab Page, as well as adding a button to your browser, which lets you add shortcuts easily. Click here to add it to Chrome! To add Homeboard to Firefox's homepage, just browse to http://homeboard.me and then drag & drop that tab onto Firefox's Home button .